What are the physical characteristics of the Earth's interior, surface and atmosphere? What are the physical characteristics of the Moon? Even though you might not think of it as such, the Earth is a planet. Here we're just going to treat it like one. 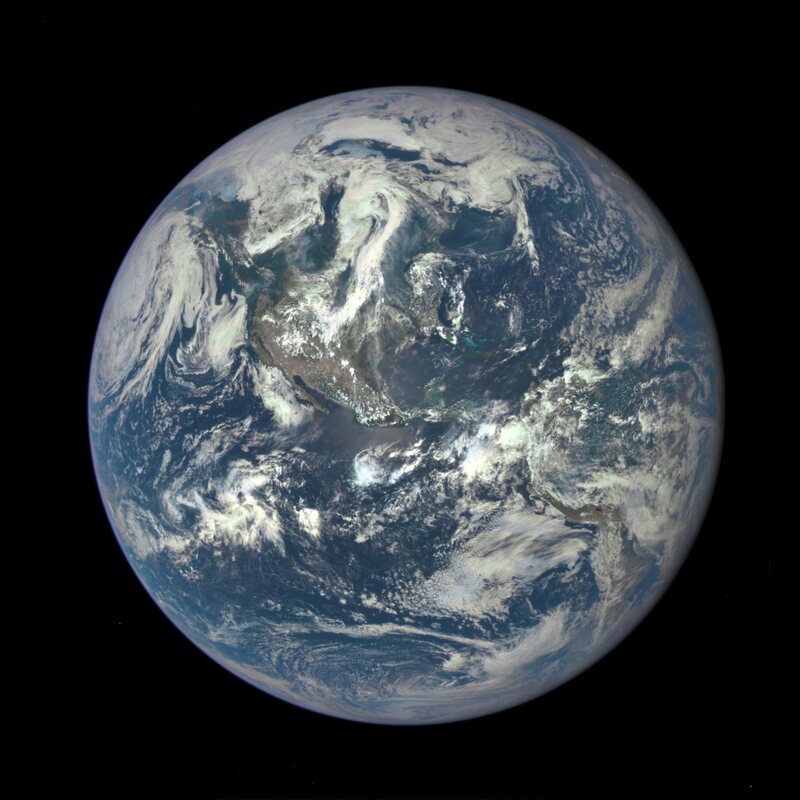 However, the Earth is a very important planet, not because you live there, but because it provides us with a basis for comparison to the other terrestrial planets. Of course, if you would like to learn more about the Earth, you can take a course in Geology or Meteorology (weather) in the Earth Science department (in no way should this be considered advertising, just plain old good advice) - but enough of the sales pitch; on to the science! 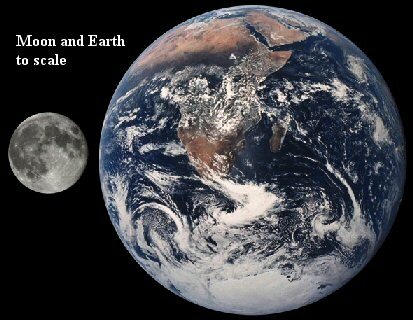 The Earth also has a large satellite (the Moon). We'll get to that one later. What exactly do we know about the Earth? What is it made of? Even though geologists have never dug a hole very far into the Earth, we still have a pretty good idea about what is going on deep inside under the surface layers that we can see. Our study of the Earth's structure will start with the center. How can we do that? How do we know what the center of the Earth is like? Geologists use the information obtained in earthquakes. Even though earthquakes are very destructive, they are also very informative since they produce various types of waves which travel through the interior of the Earth. There are actually many types of waves that are produced, but we'll only look at two of them. Pressure wave and Primary waves are other names for them. They travel faster than the other type of wave we'll discuss here. They move via a pushing or compression motion, so they can travel through both solids and liquids - this is an important feature! These move in a rather wiggly, transverse motion, sort of what you get if you take a rope and jerk it up and down quickly - a hump will travel down the length of the rope. They are also called Shear waves and Secondary waves. These travel slower than P-waves. They are produced by moving material up and down, so they can travel only through solids, not through liquids. These and other earthquake waves originate from the focus, which is the actual location of the earthquake's origin. This point can be located far below the surface of the Earth or it could be very close to the surface; it depends upon the structure of the Earth's crust at that location. More often you hear about the location of the epicenter, which is the point above the focus located on the surface of the Earth. This is where some silly news reporter will often stand, showing you where an earthquake originated from, though of course they are wrong, since it really originated from the focus. There are seismographs all over the world, so geologists can measure the travel times between the arrivals of the P- and S-waves (remember, they travel at different speeds) and this gives them an idea of the distance to the location of the earthquake's focus. First the P-waves will show up, and some time later, the S-waves show up. The amount of time between the arrivals gives an estimate to the distance of the focus. This only tells you how far away the earthquake is, not its direction from your location. To pin down the point from which the waves originated you need to use at least three separate readings. When you combine the data together, you'll get a pretty good idea of the earthquake's origin. There are earthquake monitoring stations around the world that can determine where an earthquake occurred based upon the arrival times of the waves. Also, those stations will be able to learn about the interior of the Earth based upon how the waves travel through the Earth (or don't travel through the Earth). Figure 1 shows the location of an earthquake and how the waves from it travel through the Earth. For regions near the earthquake, both P- and S-waves are detected. On the other side of the Earth from the focus, only P-waves are detected. There are also regions where P- and S- waves are not detected - the shadow zones. Figure 1. The motions of P- and S-waves are shown. The P-waves get through to most parts of the Earth, while the S-waves are much more limited in their travels. The regions where no waves are seen are the shadow zones, which for the two types of waves extend over different distances. There must be some sort of liquid in the center of the Earth to prevent the motions of S-waves through it. Also, since the P-waves are slightly deflected when they get in the middle due to the changing characteristics of the center, we know that there must be a solid core as well. From this information we can determine the structure of the Earth's interior, which is diagrammed in Figure 2. The cores are fairly large; about 55% of the radius of the Earth is contained within them. This gives the Earth a fairly high average density. Above the nickel-iron (Ni-Fe) core is the rocky mantle, which has a lower density. At the outermost part of the mantle you will find the lithosphere, which includes not only the upper mantle, but also the crust (more on this in a minute). Figure 2. A cut-away view of the interior of the Earth. Approximately 1/2 the radius is comprised of the two iron cores. Lithosphere refers to the region containing the crust. Graphic from the USGS. This type of interior model is good since it also helps to explain the strong magnetic field of the Earth. What is needed to make a strong magnetic field? Planets and satellites can have strong magnetic fields if they have two characteristics - they need a large core of electrically conducting material and also a high rotation rate. If both of these criteria are fulfilled, then the object has a pretty strong magnetic field. I should point out here that there are many things out there that conduct electricity, not just iron like in the case of the Earth's core. Now, if one of these features is not present or is really insubstantial, then the magnetic field tends to be rather weak. In the case of the Earth, the nickel-iron core is both mobile (since it is part liquid) and large. The relatively fast rotation rate for the Earth also helps. Amongst the terrestrial planets, the Earth has the strongest magnetic field by a wide margin. The area of the Earth's magnetic field (the magnetosphere) isn't nicely shaped but is sort of stretched back by strong solar winds. Particularly strong solar outbursts, like coronal mass ejections, can significantly alter the shape of the magnetosphere, causing it to narrow. Here is a little movie showing such an interaction. The magnetic field is important for the Earth since it helps to protect us from the high-energy particles from the Sun. Such particles are usually deflected by the field, though some particles are trapped for a while in the Van Allen Belts. These were discovered back in 1958 by University of Iowa astrophysicist James Van Allen (I guess that's why they're called the Van Allen Belts - unless they also hold up his pants). If the Van Allen belts get overloaded with particles, then they can leak through to the Earth's upper atmosphere, interact with the gases there and produce what are called the aurorae (also called the Northern lights). We have more aurorae when the Sun is very active, when there are many sunspots and the Sun is spewing out many more of those charged particles than usual. Of course, the further north you are, the better your chances of seeing the aurora. The core of the earth is amazing, but don't let it freak you out! Figure 4. Aurora images from the far north. 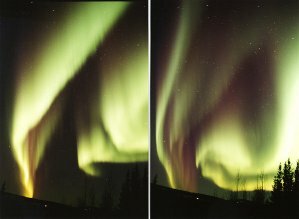 The two images are from the collect of Jan Curtis, who has many fine images of the various forms of the aurora. Check it out! The inside of the Earth isn't so exciting; the real fun doesn't start until you get to the surface - the crust! The crust is part of the lithosphere and is located above the mantle. You might be interested to know that there are actually two types of crust, and they are sort of like pizza crusts. No, they aren't filled with cheese or anything silly like that - they just have different thicknesses. As with pizza, you have a choice of thin and thick crust. The Oceanic crust is the thinner of the two, only about 5 km thick. It is made up of mainly basaltic rocks. We'll be running into a lot of basaltic rocks, and you probably know these best as the stuff that comes out of volcanoes - lava, basically. These rocks are typically dark in color and have high densities. The Continental crust is thicker, with a typical thickness of 30 km. The rocks found here are mainly granites (granitic). This is a very common rock in Iowa, since there are quite a few buildings made with granite and such in the midwest. These tend to be lighter in color compared to the basaltic rocks. The continental crust also has a lower density. If you were to go into the deepest gold mine on the Earth, you would notice that it gets hotter as you get deeper. Why? Some people presume that it is the heat from the core of the Earth and stuff like lava comes directly from the core, but that is not the case. Lava doesn't come from the center of the Earth. Actually, all that heat is from the radioactive decay of material in the mantle. This material is just doing what radioactive matter always does, breaking down and releasing heat. This material is sort of buried inside of the Earth under the crust, so the heat can't get away easily and is trapped inside. The heat does slowly move outward toward the surface of the Earth, like heat in a boiling pot of water on a stove, though of course it moves much more slowly than the bubbles in a pot of hot water. The basic upshot is that the Earth is slowly giving off heat and cooling down. Of course, it will take a long time for the Earth to cool down, since it is sort of large (at least for a terrestrial planet) and the heat can't get out of the Earth easily. There is all of this heat inside of the Earth, so it causes the rocks in the upper part of the mantle to act a little strangely. They get a bit gooey - that isn't really a good term for them, but that is sort of how they act. This upper mantle region is known as the asthenosphere. The material here only moves slowly, but the point is that it does move - it isn't rigid and sitting still. You could sort of think of the asthenosphere as a big pot of hot, gooey chocolate. It moves slowly, but it does move. Its motion carries heat toward the surface via the energy transport process known as convection. You might remember this (or perhaps you don't) as the cause of the granules in the photosphere of the Sun. As the asthenosphere moves slowly, the crust on top of it also moves. 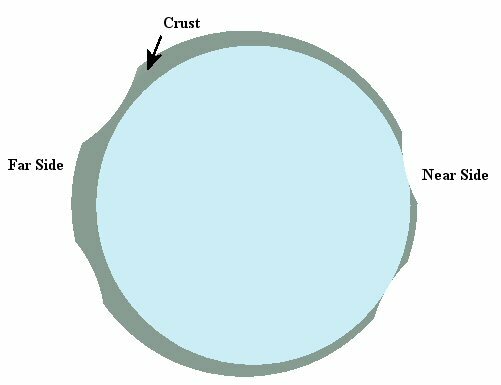 In certain locations the crust can be broken apart due to the motion of the asthenosphere in differing directions. This is particularly true for the oceanic crust, which is thinner than the continental crust. As the crust is ripped apart (slowly), material will fill in the gap, and this would be mainly in the form of basaltic lava. The oceanic crust is found at the bottom of the ocean, so we refer to this process as sea floor spreading. New oceanic crust is being produced by the influx of lava into the rift (crack in the crust) and this motion of the crust can also lead to increases in the size of the oceanic crust. The best example of this is seen in the ever increasing gap between Africa/Europe and South/North America. 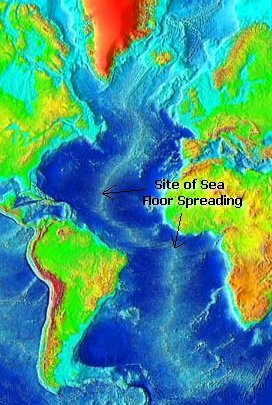 At some time in the past, these continents were connected, but the sea floor spreading has increased the distance between them - and is continuing to increase the separation. If you look at the location of this crack, you'll find the island of Iceland, which is a great big volcanic land mass - it's just full of all sorts of volcanic activity. Not only do you have volcanoes in Iceland but also things like hot springs, since heat is able to easily escape there. Even though Iceland isn't on the bottom of the ocean, all of the activity seen on Iceland is due to sea floor spreading. Figure 5. (Above left) The convective motion of the asthenosphere causes the crust to move in some rather interesting ways. In places where the crust is thin, as in the ocean, a rift or crack can form. This will slowly fill in with basaltic material (lava) as the two pieces of crust are pushed further apart. The motions of the continents can be seen in the image immediately above, which shows the early land mass that ultimately broke up into the current continents. The ridge seen in the Atlantic ocean (picture at right) shows this process as the continents to the west, North and South America, and the continents to the east, Europe and Africa, get further and further apart. Image from NOAA/NGDC. Does this mean that the Earth's crust is increasing in size? Not really - new oceanic crust is being created, but the crust is moving along and can collide with other crusts, which can lead to all sorts of interesting events. The map below shows the various boundaries between different sections of crust (which are divided into plates). At the boundaries of the plates you would find some of the more exciting events occurring on the Earth. Figure 6. The plates that the crust of the Earth is divided up into are shown. Actually, only the major plates are shown; there are many smaller plates that can't be seen on this scale. Along these plate boundaries are the locations where earthquakes and volcanoes are prone to occur. Image courtesy of NOAA. Once one crust starts heading toward another, you don't just have a collision. Usually, as in the case of an oceanic crust and a continental crust coming together, you get subduction. This is where one crust is forced below another. Why? It has to do with their densities. The oceanic crust is more dense than the continental crust, so it will "sink" while the continental crust will "float" above it. Basically, higher density stuff goes downward while lower density stuff stays on top. The oceanic crust is pushed downwards - but that's not all. Due to this downward motion, you tend to get large trenches in these areas, such as those seen near South America, the Philippines and Japan. Also, a great deal of heat is generated by the friction of the plate motions, and the basaltic material is mixed with the continental granitic material, making a much less runny (fluid) lava. This will work its way to the surface and form volcanoes near the subduction region, which are different from the volcanoes you would find in the areas of sea floor spreading (like the volcanoes of Iceland). Figure 7. Animation showing the subduction process. An oceanic crust moves toward the continental crust. Due to its higher density it is forced downward (subducted). The friction between the two crusts generates a great deal of heat, which will rise to the surface of the continental crust and form volcanoes. Where you have mainly oceanic material, you tend to get Basaltic Volcanoes. These are usually very low elevation structures and are very spread out, since the lava from these is rather fluid and flows pretty easily. Volcanoes such as those in Hawaii and Iceland are of this type. The other type of volcano, found near areas of subduction, are Composite Volcanoes. Some composite volcanoes are also known as Andesitic Volcanoes, since the rocks that come from them is andesite (like basalt, but has more silicon in it and other differences). The lava from these is different than that found in the basaltic volcanoes (remember, it's a mix of basaltic and granitic material), so these volcanoes tend to be taller and not as spread out. This is due to the lava being less fluid, so it doesn't spread out as easily. 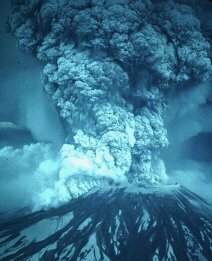 Volcanoes that fall into this category include Mount St. Helens, the volcanoes in the Andes, and the Cascade mountains of the Pacific Northwest. People have to watch out for some of these volcanoes since they can cause widespread damage. The composite volcanoes tend to be much more catastrophic when they erupt. They tend to bottle up their energy until they blow their tops rather violently. Basaltic volcanoes can be pretty bad as well, but they don't get bottled up so much and instead erupt fairly frequently, so they don't have as much energy to expel at any one moment - kind of like the difference between constipation and diarrhea. Figure 8. Upper left, a basaltic volcano seen in Hawaii. Upper right, a composite volcano in Washington State. The graph directly above shows a comparison of basaltic and composite volcanoes, in this case the island of Hawaii and Mount Rainier. Notice how the basaltic volcano has very fluid lava - it's the stuff that is usually shown in movies and this helps to spread out the volcano. The composite volcano shown at the top, in this case Mt St. Helens, doesn't have as big an outflow of lava as do Hawaii's volcanoes. Images and graphs from the USGS. There are also volcanoes that are not produced by continental subduction or sea floor spreading but by hot spots, places where the crust is broken through by the strong upward swell of hot material. Hawaii is an example of this. If you were to look at the islands that make up the state of Hawaii as well as the chain of underwater mountains that stretch off to the northwest, you'd actually be looking at a bunch of extinct volcanoes. These all came from the same hot spot, but since the volcanoes were built up on a plate that is moving, the volcanic mountain eventually got too far from the hot spot to remain active. Currently only the big island of Hawaii is over the hot spot, and all other parts of the chain are extinct. While it is easier to break through the thinner oceanic crust, it is also possible to crack the continental crust. An example of this can be seen in the East African rift, where the area around Ethiopia, Kenya and Tanzania will eventually break off from the main continent. There are also hot spots under continental crust, and one place where this can be seen is in Yellowstone park. Due to all of this motion of the crust and volcanism, if you want to study old rocks and old surfaces on the Earth then you need to look at continents (continental crust) rather than at the ocean floor. There are many parts of the continental crust that do get re-surfaced by weathering effects or water erosion, so not all parts of the continental crust are old. When we talk about "ages" of planetary surfaces, we tend to refer to when the surface was formed. If something like volcanism, glaciers or other erosion effects has altered the surface significantly, then the surface is "young," especially if these things happen on relatively short times scales. As you'll see, the surface of the Earth is pretty young compared to other objects in the solar system. This is something you should keep in mind when we look at other planets. You might be wondering about all of these plate motions that have been going on for some time. Why do they occur? If you remember, the plates move because the asthenosphere is hot and mobile and it is using convection to move heat from the interior of the Earth to the surface. You'll remember that the Earth is hot because of radioactive decay. A planet that is hot is gradually losing heat and as a result you get things like plate tectonics, volcanoes and earthquakes. A planet that has cooled down completely would be inactive - no heat to drive any motions. This is something we'll have to watch out for when we look at other planets. Fortunately for us, the Earth has an atmosphere and, of course, the other things that go with an atmosphere, such as rain, snow, sleet, hurricanes and all those other fun things. We won't look at that aspect of it (and, of course, if you are interested in learning more about weather, take an Elements of Weather class). We'll stick more to the physical characteristics of the Earth's atmosphere. Even though there is only a small amount of CO2 in the above list, it is known that the amount has been gradually increasing over the past few centuries (when we started measuring the amount of atmospheric gases and how they change over time). This has been linked to the increased amount of industrialization in the world, but that's a topic for a Crapstone, uh, Capstone class. If you look at the composition of the atmosphere listed above, you'll see that it is pretty heavy in the amounts of oxygen, nitrogen and carbon with just a bit of hydrogen. Is this the atmosphere that the Earth started out with? No, remember that the cloud out of which the solar system formed was predominantly hydrogen and helium, not the heavy elements (like carbon, nitrogen and oxygen) that are found in the Earth's current atmospheric composition. The first early atmosphere (the primary atmosphere) had more of the lightweight gases and hydrogen rich molecules, stuff like H2, NH3 (ammonia), and CH4 (methane). Due to the close proximity of the Earth to the Sun, the atmosphere would have gotten a lot of heat; this would have caused many of these lightweight molecules to break down and most of the hydrogen would have been lost to space. That's because hydrogen is such a lightweight gas and you don't have to heat it up very much to get the atoms moving fast enough to fly off into space. The early hydrogen-rich atmosphere would have slowly drained away. The current atmosphere is a secondary atmosphere, sort of a replacement atmosphere. Where did it come from? To answer that we need to take a look at volcanoes again. This is all quite interesting, but our atmosphere isn't predominantly Water and CO2! That's okay, because we don't have to have all of this stuff stay in the atmosphere; it could go elsewhere. The water went into composing the oceans around the Earth. Our planet is at a distance from the Sun where water can be in a range of possible states (gas, liquid and solid). Fortunately for us, most of it went into a liquid state. That takes care of the first thing on the list, but what about the CO2? With liquid oceans, gases such as CO2 can be trapped in the sedimentation (rock formation) processes that are operating. Virtually all the volcanic CO2 of the early Earth was removed by the oceans and is currently in the Earth's rocks. If the CO2 that is currently trapped in the Earth's rocks were to be released from the rocks, we would have an atmosphere that would be very nasty and rather toxic to us. We also have many biological processes occurring in the past as well as today - LIFE! Things such as pond scum, which would have been quite abundant in the early Earth, would have been able to help alter the composition of the atmosphere. The amount of oxygen in the atmosphere of the Earth increased steadily in the early history of the Earth until it reached a level near that seen today. It is also likely that a lot of the water vapor could have been broken up into hydrogen and oxygen, with the hydrogen escaping out of the atmosphere. Some people suspect that a good fraction of the water on the Earth got here from objects from space like comets (which are composed mainly of water). Others question the importance of comets in the whole process. Our current atmosphere is pretty nice, since it keeps us alive and protects us. It and the Earth's magnetic field help to deflect or diminish the effect of nasty particles from space. Remember, most types of light can't get to the surface of the Earth because of our atmosphere. It also keeps us relatively stable, temperature wise. If you ever go outside on a clear winter night, you may notice that it is very cold. On a cloudy winter night, the temperature doesn't go down as low. Clouds and water vapor help to blanket the Earth and trap some heat in. This is what is known as a Greenhouse effect, though it isn't as drastic as some Greenhouse effects that you'll see. On the Earth, the main Greenhouse gas is water vapor, but carbon dioxide (CO2) can also act as a Greenhouse gas. As I mentioned before, the amount of carbon dioxide in our atmosphere has been increasing over time, and some people point to this as a possible disaster, since it will increase the overall temperature of the Earth. As mentioned before, when you look at the surface of the Earth, you can see extensive evidence of erosion processes due to water and wind, as well as other effects - landslides, volcanism, earthquakes, etc. The surface of the Earth is continually changing due to these processes and also the influence of so-called intelligent life. When you look around the surface of the Earth, you see very few impact craters, not because the Earth avoided getting hit by objects during the early history of the solar system, but because it has covered up the effects. We got hit quite a bit, but because of our continually changing surface, the evidence has been removed. A lack of craters on a planet's surface indicates that there are processes at work that are able to cover up or erase the craters fairly quickly. Due to this, the Earth is considered to have a very young planetary surface. You may not know this, but there is actually a rather large crater in the state of Iowa. Just check out this web site for information about it! Objects such as volcanoes, lava flows, impact craters, sand dunes, ice caps, faults and large, smooth plains are seen not only on the Earth but other planets as well, as we shall see. Try to remember what these things are and what they indicate about a planet when we check them out on other worlds. The Moon is the only other world that humans have walked on. Due to its rather large size, it isn't unrealistic to consider the Moon a planet, though technically we can't call it one since it is really just a very large satellite of the Earth. Some astronomers like to think of the Earth and the Moon as a binary planet system, but that is just a little too radical for me. What are its characteristics? First of all, there is no atmosphere, so that makes that discussion short. However, because of the lack of an atmosphere, there is nothing to regulate the surface temperature. Remember how the Earth's temperature can be influenced by cloud cover? - with more clouds, more heat is trapped in. Without such a luxury on the Moon, there is nothing to trap or store any of the heat, so there is a wide temperature variation. This causes the daytime temperature of the Moon to be pretty high, around 400 K (which is 266 degrees F), while the nighttime temperature is only about 100 K (-280 degrees F). Mare. The name means "sea" and these are of course not seas, since there is no liquid water on the Moon (since there is no atmosphere). Their smooth, dark appearances caused early astronomers to give them this name. These are, in fact, large impact craters or basins that have filled in with dark basaltic lava. That helps to explain their circular shape. It is interesting to note that there is quite a gap between when the impact occurred that made the basin and when the basin filled up with lava. Even though they look pretty big, they only cover about 17% of the Moon's surface. Highlands. These are the amongst the oldest regions of the Moon, and are rougher and more heavily cratered than the Mare. Compared to the Mare, they are much lighter in color. These are the most common feature, covering about 83% of the Moon's surface. Mountains. These are found mainly in highlands and associated with the rims of large impact craters. Various chains of mountains are actually the edges of craters that haven't been eroded away or covered up by the formation of the Mare. Volcanic features. There are only small numbers of volcanic mountains as well as a few lava flow tubes - objects known as rilles. Large crack-like features, which are technically known as graben (a type of fault). Recently careful analysis of these features have classified some of the faults as scarps, which is a long cliff-like feature, which may be the result of the cooling of the Moon, and the subsequent shrinkage as it lost heat. Before continuing on I should say something about craters. Craters are, for the most part, due to impacts. It can be confusing, though, since sometimes the opening of a volcano is referred to as a crater as well. I'll try to stick to the usage of craters as an impact feature. As you'll see, there are many forms of craters - big, small, really huge, and so on. Some craters have a peak in the middle, sort of as a bouncing-back effect; some don't. Some craters have rays (bright streaks radiating from them); some don't. Some craters have well defined rims; some don't. There are many reasons why craters have certain features, which can include the type of terrain that they were produced in, the size of the object hitting the surface, the angle and speed with which it hit, and the amount of erosion that can remove or cover features. What might produce a certain type of crater on one world will produce a different type of crater on another world - just something to keep in mind. The surface of the Moon does not experience significant changes to its features like the surface of the Earth does, so it has a very old surface. Actually, it appears that the Moon is geologically dead. This is because there does not appear to be any current volcanism and there has been very little change in the crust for some time. Evidence from the recent Lunar Reconnaissance Orbiter indicate there are only a few small areas of the Moon that may have been volcanically active 50-100 million years ago, but since then nothing has really happened. Why is the Moon so "dead" and the Earth so "active" (geologically speaking)? First of all, you have to remember where the activity comes from - heat. That heat is mainly produced by the radioactive decay of material. The Moon has much less mass in it compared to the Earth, so there was much less radioactivity and therefore much less heat. The Moon is a much smaller object with a much thinner mantle, so it doesn't take very long for the heat to escape into space. The Moon has pretty much cooled off. This is sort of how big and small objects cool down - big things take much longer to cool down completely because they are so darned big! A puny thing like the Moon cooled down quite quickly. The Moon is pretty dead today. Figure 9. A current model of the lunar interior based upon seismic information obtained by the Apollo mission instruments. This diagram and most images in this section are from NASA. One interesting feature of the Moon is that its composition is very similar to that of the Earth's mantle. This provides a clue as to its origin. Its composition also tells us that there isn't much iron in the Moon. Only recently have we been able to model the Moon accurately, in part from information initially obtained during the Apollo missions. It appears that the Moon's internal structure may be quite similar to the Earth's though of course on a much smaller scale. Some of the rocks on the Moon do have some magnetic remnants in them, indicating that some time in the past the Moon's magnetic field was stronger, possibly when it was hotter and more active. Today it really doesn't have a significant magnetic field. We can only see one side of the Moon from the Earth, so it wasn't until the 1960s that spacecraft traveled to and photographed the side that is turned away from the Earth. 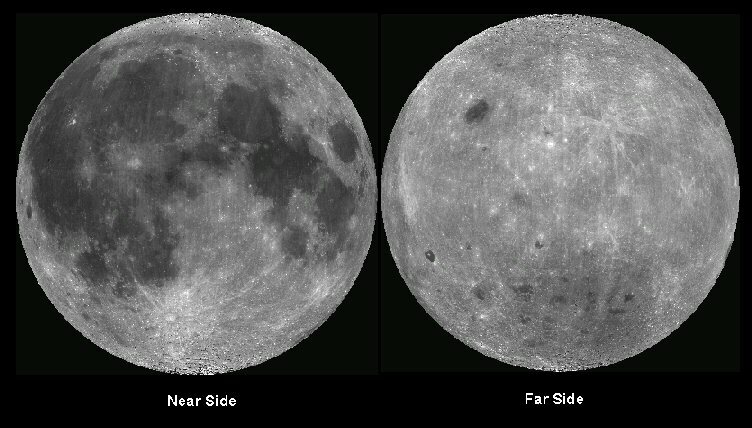 Surprisingly, the two sides of the Moon have quite different characteristics. The Near Side is the side that always faces the Earth. It has many large mare but not a lot of old craters. The Far Side faces away from the Earth and has many impact craters and highlands. There are significantly more craters seen on the far side, and for the most part, no mare. Why the differences between the two sides? There is a very simple reason for the difference. The crust on the far side is thicker. If you measured the average elevation on the two sides of the Moon, you'd see that the near side has a lower than average elevation, while the far side has a higher than average elevation - it's thicker on the far side! Due to this, impacts, even large impacts, did not break through the crust and fill in with lava to produce mare in the way this happened on the near side, where the crust is thinner. Click here to see a movie of the Moon rotating around. (Movie from Calvin J. Hamilton). Figure 10. Views of the Near and Far sides are shown above, illustrating how the two sides differ. A cross section of the Moon interior is shown at right, showing the differences in the near and far side crusts. A slightly thinner crust on the near side allowed for the formation of Mare there. Moon images courtesy of NASA. Why do we only see one side? It's because the Moon is tidally locked to the Earth. This stuff was discussed way back in the section of the course dealing with the phases of the Moon and that stuff, so you may want to refresh your memory and take a look at that material again. Our tidal pull on the Moon is so strong (since we're bigger) that we have locked one side of the Moon to always face the Earth. The Moon pulls on us as well, causing things like tides, and these raise the ocean levels twice a day in some parts of the world. The Moon is pulling on the Earth and we are pulling on the Moon. We've been pulling on it (and it has been pulling on us) since the day the Moon formed. You should also remember that the tidal pull of the Moon is slowing down the rotation rate of the Earth, so our days are getting longer and longer. We know that in the past, the Earth rotated much faster and the Moon was closer to the Earth in its orbit. During these early years, the Moon would have been moving around the Earth very fast - remember Kepler's Third Law - so its orbital period would have been much shorter, perhaps only a few days (rather than nearly 30 days). At this time the tides would have been many times higher than they are today - big time flooding in some spots! As I said, things are changing. The tidal forces are gradually causing a slowdown in the Earth's rotation, and as a side effect, the Moon is moving further away from the Earth. Eventually the Earth will slow down considerably and the Moon will be so far away that only one side of the Earth will be aimed toward the Moon. The Earth and the Moon will both be tidally locked! By the time this happens the Sun will be dying, so it won't make much difference anyways. We know that this stuff is happening since we can measure the rotation rate of the Earth as well as the increasing distance that the Moon is getting from us. It's moving away from us at the astounding speed of 3.8 cm every year. Figure 11. Images from the exploration of the Moon by the Apollo astronauts. We learned a great deal about the Moon from the six Apollo missions that took place between July 1969 - December 1972 (were you alive then?). The 12 astronauts who walked on the Moon spent 300 hours on the surface, gathered 850 pounds of rock and dirt, and occasionally hit a golf ball around. Due to safety considerations, they landed only on the Near side and in the smoothest places - the Mare. Due to this, most of the rocks they gathered were from the Mare regions. The later Apollo missions made use of a lunar rover that allowed them to travel closer to the highland areas and get a wider range of lunar rocks. Basalts, which are just like the lava that comes out of volcanoes on the Earth. These are relatively high density and dark in color. They contain iron, manganese, and titanium. Obviously, most of this came from the mare regions. These rocks are relatively young, only about 3.1 to 3.8 billion years old. Anorthosites, which were collected mainly from the highland regions. These are also seen on the Earth (in the old mountain ranges like the Adirondacks) and are a mix of aluminum, calcium, and silicates. These tend to be lighter in color and lower in density when compared to the basalts. These are also older than the basalts, closer to 4 or 4.3 billion years old. Breccia, which is just material cemented together by impacts. These would contain mixtures of different rock types. Figure 12. Various rocks returned from the Moon. Left, some mare basalt. Notice how porous it is, very much like volcanic basalt on the Earth. Center, anorthosite, the rock from the highlands. Right, breccia, formed by impacts that cement together rocks. While the Apollo missions mark the only time humans went to the Moon, other missions have continued to study it. The recent Clementine mission (1994) carefully mapped out some of the more obscure regions of the Moon and made a rather interesting discovery. 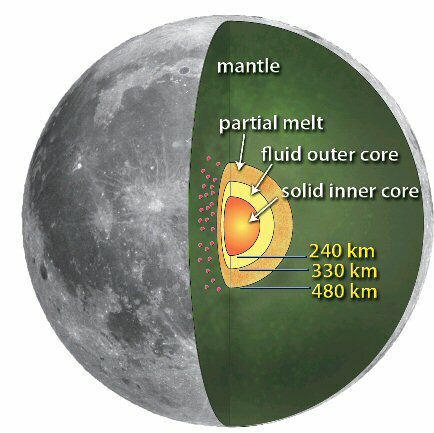 Based upon the way that radiation was reflected off of the surface, it appears that there may be a great deal of water ice located in deep craters at the lunar poles. This finding was also supported by the later Lunar Prospector mission (1998). How is this possible? It is easily possible if the ice is found in a crater that is deep enough so that no direct sunlight falls upon it. Remember how cold the unlit side of the Moon is? - pretty cold. If ice gets into a deep, dark crater, then the ice will stay there - nothing will be able to reach it to melt it. The ice may have originally come from ice laden objects like comets that struck the surface long ago. The scientists were so sure that there was some water up there that the folks at NASA decided to crash the Lunar Prospector spacecraft near one of the suspected ice rich spots. They were hoping to vaporize some of the water and then telescopes on the Earth could see the plume of material. Unfortunately, nothing was seen after the crash, though there could be several reasons for that, not just that there is no ice. Stay tuned for further developments in this area. It took about 10 years before we decided to again check out the Moon in detail and at this time there have been several missions looking for water on the Moon. Amongst these are the Chandrayaan-1 mission launched by India, which in 2009 found evidence for water molecules and molecules that were thought to form from water on the Moon. This mission looked at the light reflected from the surface of the Moon for these molecules, so basically they looked at the spectra. Other missions seemed to confirm this remote detection of water molecules. A much more "intense" mission was LCROSS, which used direct impacts into the surface of the Moon, like the Lunar Prospector, but they hit it with 2 components - the booster rocket and the spacecraft itself. Both hit a crater near the southpole of the Moon October 9, 2009. And the results? Well, yes, they detected water, but not in huge amounts, but in amounts greater than previously thought. Mixed in with the water was rocky material, methane, carbon dioxide, ammonia and carbon monoxide. Observations by the Lunar Reconnaissance Orbiter also indicated that there may be a great deal of ice located in the south polar crater Shackleton. The problem with some of these studies is that there is no direct observation since any sunlight would melt the ice. But by looking at how light is reflected from the surface using lasers, astronomers have found very smooth and "shiny" surfaces, which may be due to ice. So you can certainly find water on the Moon (in ice form), but not a massive amount. If you plan to go to the Moon anytime soon, you'll certainly want to take along your own filled up water bottle. Where did the Moon come from? We have quite a few clues as to its origin. There is the fact that the composition is very similar to the Earth's mantle, and the fact that in the past the Moon was much closer to the Earth. The lack of water in the rocks and regolith also tells us something about the way that it formed. Right now, the currently favored theory about the origin of the Moon is the Impact theory. It is unlikely that the Moon and the Earth would have been able to form in the early solar system as two separate objects, since gravity would have tended to pull them together into one large planet. The basics of the impact theory are that an object about 1/3 the size of the Earth came along and hit the early Earth (soon after it formed and differentiated), sending up a lot of debris into space. The effects of this early impact on the Earth would have been covered over long ago, so there is no evidence of it still around today. The debris that was tossed up into space would have been heated up and would have lost most of its water (remember, the Moon is pretty dry). Over time this material would have gradually come together and form into the thing we call the Moon. At first the Moon would have been pretty close to the Earth; as time went on the rotations of both the Earth and the Moon slowed down, and the Moon would have moved further away from the Earth. The chances of such a big impact occurring in the early solar system is pretty good, mainly because there was so much stuff out there that could hit planets. Figure 13. The formation of the Moon step by step. A large object strikes the Earth. Only the outer layers of the Earth are greatly involved in the process. The impact throws a huge amount of material into space. Most of the material was from the mantle, so this explains the current composition of the Moon pretty well. Also, the energy from the explosion would have baked the material thoroughly, causing the lunar rocks to be pretty dry. A concentration of material would develop from the debris in orbit, and this would gradually come together and form the Moon. The Earth would eventually recover from the impact and be spherical once again. Click here or here to see this in an animation. Image and animation from the Southwest Research Institute. 4.5 billion years ago (b.y.a.) - Moon formed (probably via the impact theory). It should be noted that this time estimate allows enough time for the Earth to form beforehand. Current age estimates for the Moon always seem to have it slightly younger than the rest of the solar system. 4.5-4 b.y.a. 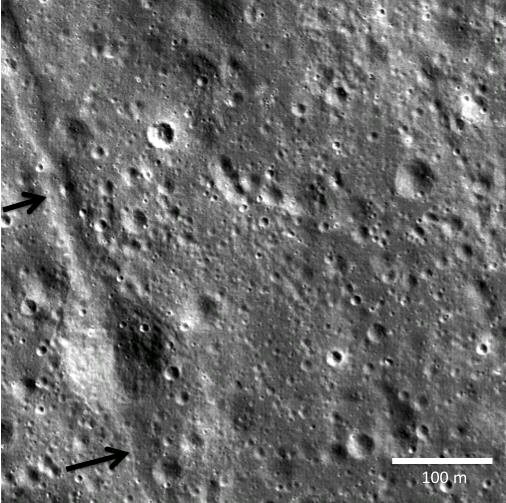 - large impacts produced basins on the Moon. The impacts on the near side of the Moon would be eventually covered up by lava (see the next step). Those produced on the far side would eventually get covered up by later smaller impacts. This is the time of the Heavy Bombardment. 3.5-3 b.y.a. - lava filled the basins on the near side to produce the Mare. 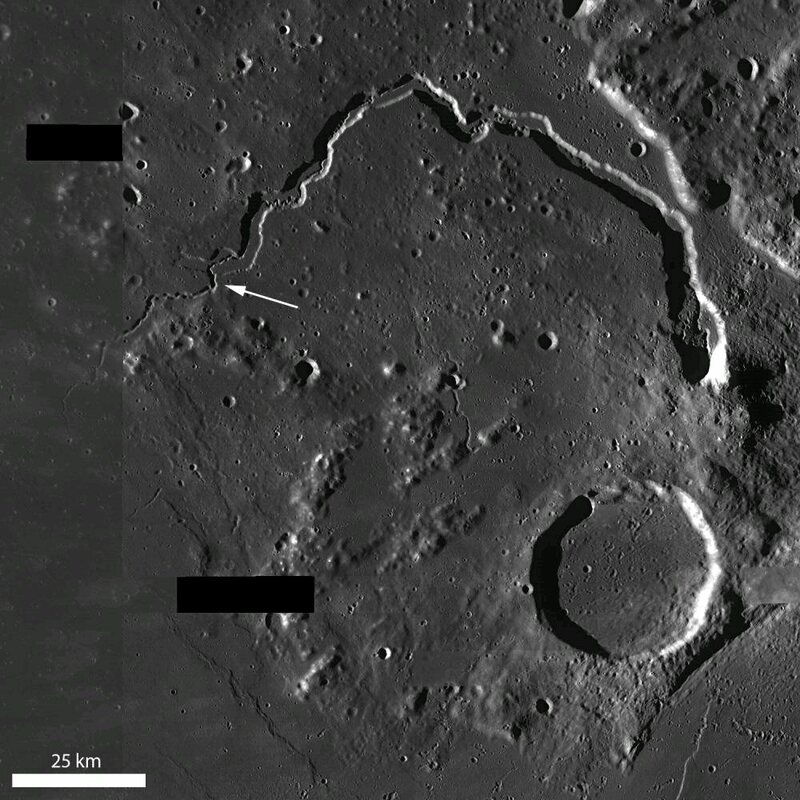 The delay in filling the basins is due to the low level of heat in the Moon and the slow motion of the lava. The crust on the far side is thicker, so the lava wasn't able to get to those basins, fill them in and smooth them over. 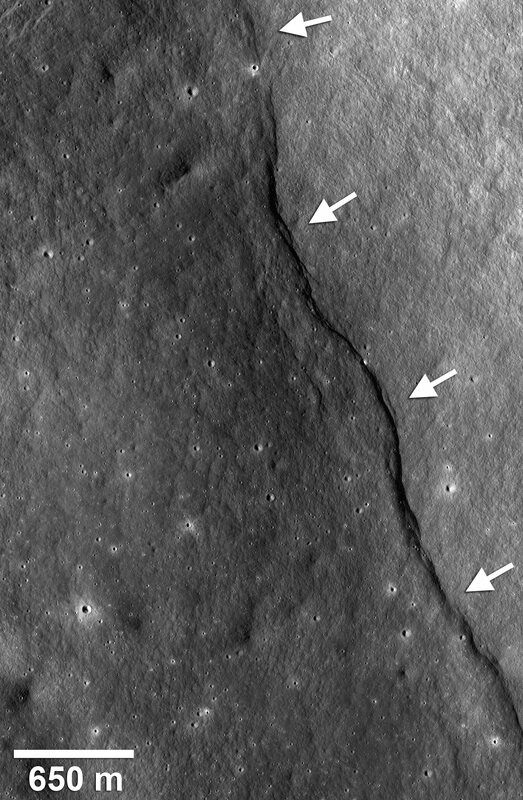 All of the impact scars remained on the far side and are still seen today by spacecraft that travel there (since nothing, but more impacts, have ever altered them). 3 b.y.a to July 1969 - not a lot of action; just occasional craters. The Moon was basically just getting further away from the Earth (which is what it had been doing since it formed), and becoming less geologically active. July 1969 - December 1972 - People started visiting the Moon. Apollo 11 landed, first of six missions to the moon (Apollo 11, 12, 14, 15, 16, 17). July 1999 - Lunar Prospector crashed on the surface of the Moon, but no water was detected. October 2009 - LCROSS impacts the surface of Moon and detects some water. The Future - Who knows? Will we ever go back to the Moon? Will there ever be colonies on the Moon? We'll just have to wait and see. How can earthquakes be used to probe the interior of the Earth? What is the interior of the Earth like? What is needed to produce a strong magnetic field in a planet? What evidence do we have that the surface of the Earth changes over time? What causes the continents to move around? What are the different types of volcanoes on the Earth and what characteristics do each have? How did our current atmosphere develop? What surface features are seen on the Moon? 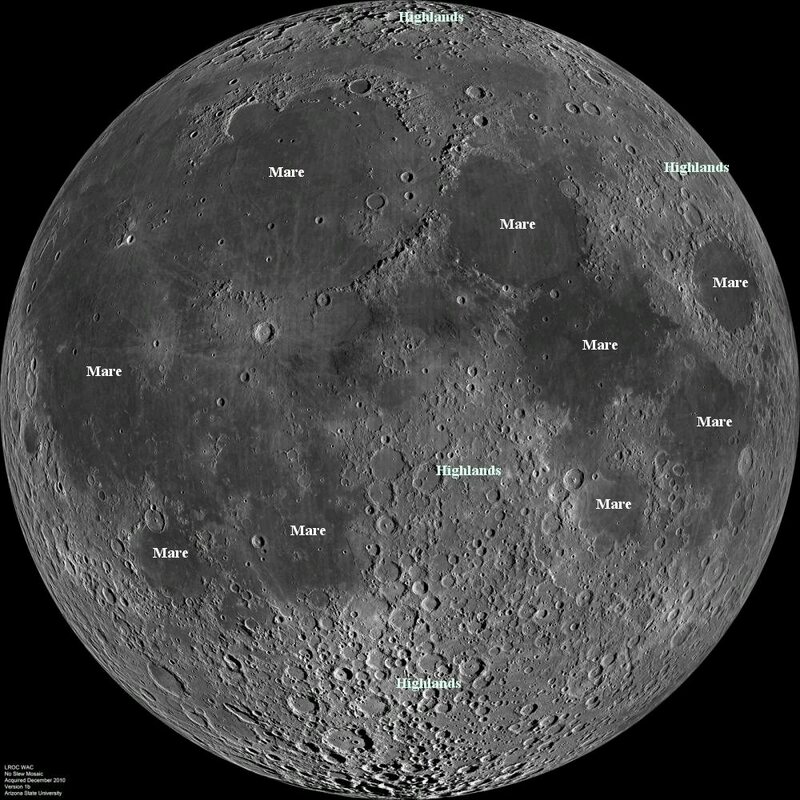 What are the differences between the near and far side of the Moon? What causes those differences? What was learned from the Apollo missions to the Moon? What evidence exists that indicate the Moon may have formed from an impact?